Who here has a design wall? Did you make it yourself and what materials did you use? I'm limited on height (my quilt room is an upstairs loft, and the walls are about 4 feet tall at the most. I went to a quilting retreat earlier this year, and realized how important this thing is! I don't really have a design wall designated. I lay things out on top of my bed on a flannel vinyl-backed table cloth. I also have taken it and attached it to hangers that have clips for pants, then hang it on the curtain rod on my double window which has about 4 supports It isn't heavy. If I need to take it down but don't want to move any of the blocks, I can just roll/fold it up, take hangers off the rod and put on a shelf or off to the side. very portable. I made a design board. I used a 4' x 4' piece of peg board, put a layer of batting on it, and then covered it with a table cloth, fuzzy back side out. I used a stapler to attached the covering. I then put a board (1x2") across the back near the top that nests with a 1x2" board on my wall so I can hang the board or lift it off and put it anywhere in the room I want. We used a sheet of insulation board (the pink stuff from Johnson/Manville--pink panther logo--found at home improvement stores). Covered it with felt and hung it on the wall. It could also be leaned against the wall if you have low ceilings or if you want to move it around. The insulation board comes in 4x8 foot sheets but is easy to cut down to whatever size you need and it's lightweight. The guys at the store will even cut it for you if you smile real nice and say please! 2 yards of ivory fleece, 1 package of Velcro. The Velcro package was one side sew on and one side stick on. The stick on went on the wall - the sew on went on the fleece, so my wall is 60" x 72" and easily removable. The fleece holds very well unless a certain Border Collie clears the lower area with her tail. I used a 4' x 8' white sheet of insulation board that I bought at the Home Depot. It is easily cut (watch those do it yourself shows on DIY or HGTV) I covered it with a neutral flannel. I thought I would want to wash it so I used safety pins on the edges of the fabric and took some jewelry jute and thread it back and forth for a tight fit. Insulation is the best since it is lightweight and you can stick pins in it. I have had it for over 10 years and I have never even thought of washing it. I just use one of those lint roller I got at JAF with a 60% off coupon and it seems to do the trick. Good Luck!! Ditto except I used duct tape to attach the flannel. I too have it loose so I can move it around. I use a flat flannel sheet suspended from three skirt hangers that are hung on command hooks high up on my wall. Read about this somewhere on the internet and it works okay for me, though I wish it were a little more stable. Since it isn't secured on the sides or bottom it moves or ripples a little but it's okay. I got a piece of felt (60" wide) at Joanns when on sale and sewed a channel on each end and then inserted a rod I could hang it from in my sewing space. Easy to take down and not much mounting on the wall. I use a flannel backed tablecloth for my design wall also. I bought the curtain rings with the little teeth clips and put it up on a rod. That's how mine is too, inexpensive and works well. My husband made mine I covered it in flannel. It takes up most of one wall. I bought two sheets of the 4' x 8' "pink panther" board at HD. Had to cut a few inches off each of them with a razor knife as we have 8' ceilings. Then bought a king-size fleece blanket on sale. Cut it in two and it easily covered each. "Laced" it together on the back of each with string. I just have them leaning against the wall. Can easily take them to the basement if I want to when company stays in the room. Pins go in easily when you need to make things more stable. A quick swipe with the lint roller is all that is needed to get the inevitable threads off. If I didn't have these, a flannel backed tablecloth would be my choice. Flannel sheet, curtain rod in sleeve on top and bottom to keep it hanging straight. Hung up using several large command hooks. We just did an 8 ft high by 10 foot wide design wall in my sewing room. Husband found 1/2 inch sound insulation board which we trimmed to fit and then I covered with Warm and Natural batting. It is good to use either a basting spray or light adhesive but not 100% necessary. I pulled around the back and stapled down. Then we screwed into furring strips on the wall. These were only necessary since we wanted to go over the molding that was along the floor. The Warm and Natural is sturdy enough to pull smooth without making holes and it looks great and things stick. 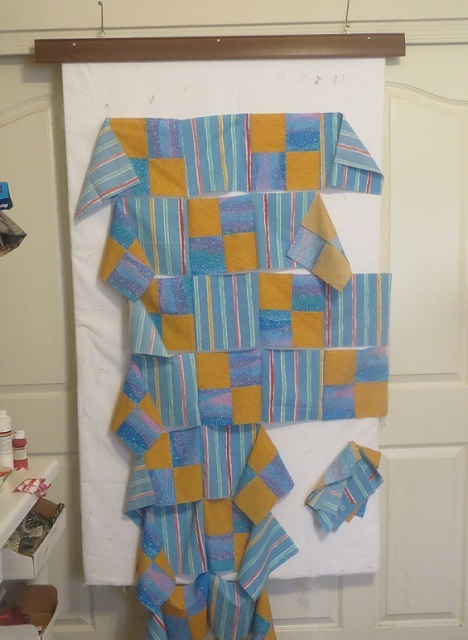 I can layout a whole quilt on the wall by just smoothing the pieces in place. Heavier blocks and chuncks are easily pinned in place. The batting which was on sale was the best choice for me. Same here with insulation board. I have one of those houses too. Ours has a barn roof, so the walls angle. I cut my board at 6'. Because it is so light, you can move it anywhere. I put a flannel backed tablecloth on it & used large binder clips to hold it in place. that is what i am doing now. i put hooks in top hem and then hang it from those press in angled picture hanger things that i have put into top of trim arounf deck door. i hace a 1/2" wood dowel from ace hardware in bottom hem to hold it out straight. easy to take down when we have company at meal times. then hang it right back up again. last house i had a spare bedroom for a sewing room. we had bought a new refrigerater and i used the packing carton covered with felt for a design board. hubs & i screwed it to wall w wide washers. it hung and was still in excellent condition when i moved after 13 years. in fact it was so rigid still that i had a little trouble taking it down by myself ). Wow - I can't go wrong with all these answers! Thanks ya'll so much!! I went to Home Depot and bought a piece of foam insulation, the kind they insulate houses with. I cut it down a bit, I think it was a 4' x 8' sheet, covered it with flannenl (wrapped the flannel around and pinned to the back.) I atached a board across the top, then put large eye hooks on the board, then put screws into the wall above the closet and attached wire to that, which ends in a loop. The eye hooks hook onto the wire loop. It can be taken down and storeed in the garage when not needed. Paint - There is an area in the hall where the wall height is higher, so I'll lean it against that. Mine is made of foam core and covered with headliner fabric. Size is 4 feet x 8 feet. I have two. One is always upright in my sewing room and used for individual blocks, pictures, etc, the other is used in the family room when I a whole quilt to lay out. Unfortunately my cats LOVE the design walls for climbing. One climbs the wall in the sewing room and sleeps on the top. When I get the other one out they all come running as they think it is play time. Once they have that out of their system I can use it to preview the layout. I love my design board. I made out of 2 4' X 8' sheets of 1 1/2 inch foam board, from lumber yard. My husband cut them both down to 6 1/2' in height, as my basement ceiling is only 7' high. I taped them together on one side with package striping tape. Then I covered them with a large piece of flannel and pinned the flannel to the foam board (this is construction foam insulation). Where I taped the two pieces together, I can fold them in half, thus taking up 4' of wall space, except when I am using it. I can also stand it in the middle of the room, as when I open it, I leave in the a very shallow V, and it will stand alone by itself. I really love it. I got one of those project display boards that kids for school and glued a piece of felt to it. I bought mine at Office Max, I think, for about five bucks. Next one I make will have cotton flannel. I don't think stuff sticks to the acrylic felt as well. It's great because it folds up and out of the way and I can tote it to classes if I ever get to take any more. My dream sewing room would have an entire wall dedicated as a design wall, with one of those old-timey library ladders that slides back and forth. So, felt doesn't stick as well as fleece? What are ya'lls opinion on that? Are there any pictures here of design walls? Or can you ladies post pics of yours? I even tried a search and this thread doesn't even show up!